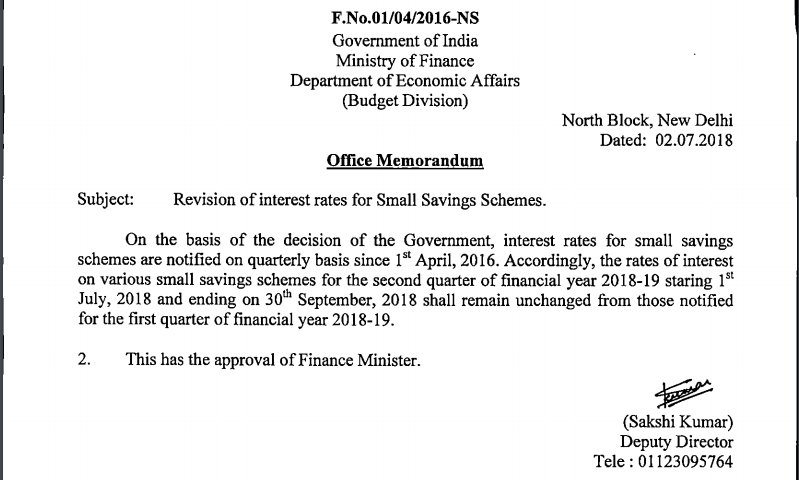 Government of India announces interest rate on small saving schemes like PPF, Senior Citizen Savings Scheme, Post Office Fixed and Recurring Deposits and Sukanya Samriddhi Account every quarter effective April 2016. This is done to keep these interest rates in sync with the market rates. The government has revised the interest rate on post office time deposit schemes while leaving rates of other popular small savings schemes like the PPF (Public Provident Fund), Sukanya Samriddhi account and Senior Citizen Savings schemes unchanged. As expected the interest rate for Small Saving Scheme has increased by 0.3% to 0.4%. The new PPF & NSC interest rate is 8%. 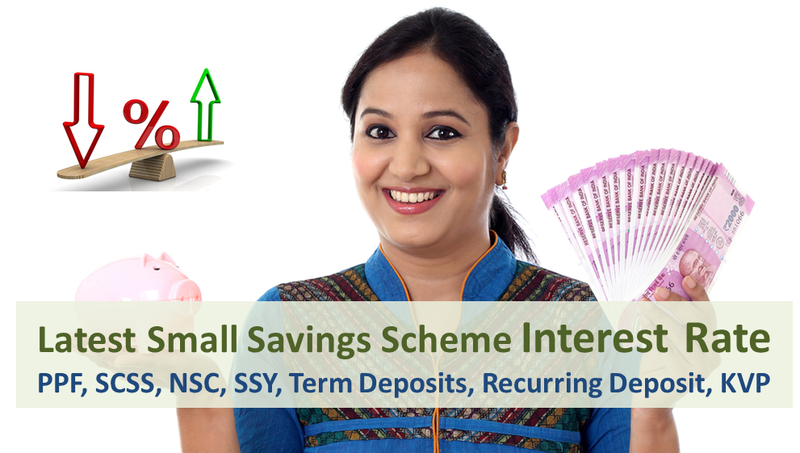 The SCSS interest rate has increased to 8.7% and Sukanya Samriddhi Account would offer 8.5%. You can read the detailed notification here. There has been NO change in the interest rates as compared to the last quarter. The expectation was the interest rates would go up as the government bond yields which is the benchmark for setting these rates had gone up. Unfortunately the government is NOT following its own rules! Download the Official Notification from here. The interest rate on small saving schemes have been reduced by 0.2% (except for Senior Citizens Saving Scheme) for January 1, 2018 to March 31, 2018 quarter. PPF and NSC will fetch a lower annual rate of 7.6% while KVP will yield 7.3% and mature in 118 months. 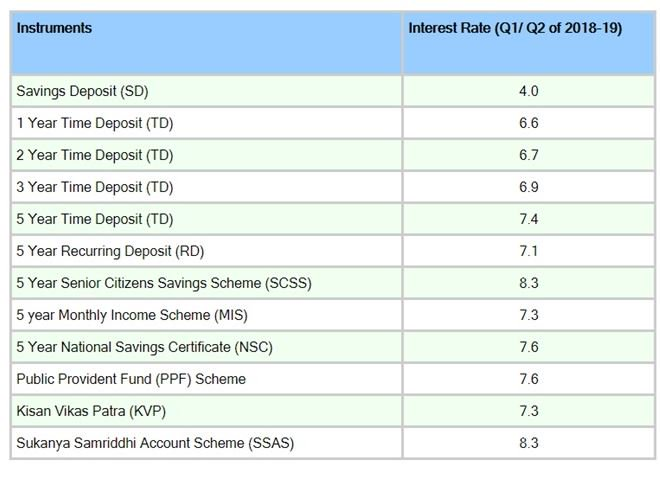 Term deposits of 1-5 years will fetch a lower interest rate of 6.6% – 7.4%, to be paid quarterly, while the five-year recurring deposit is pegged at 6.9%. 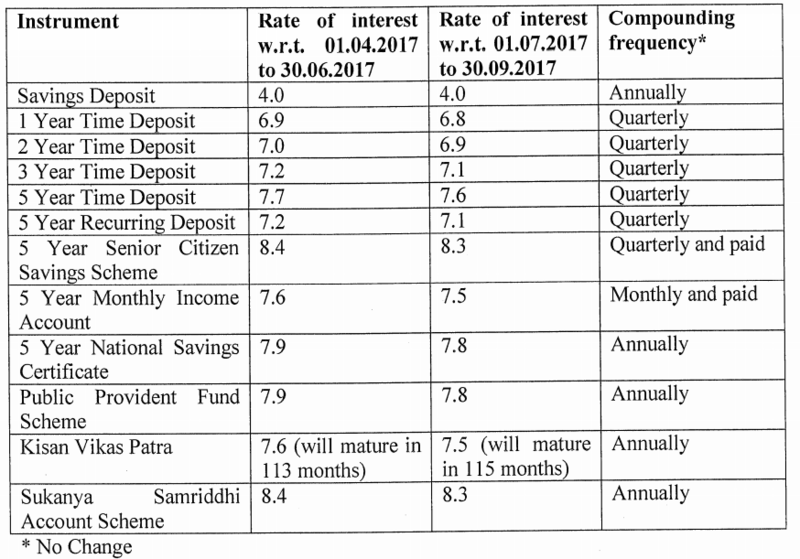 Post Office Savings Account Interest Rate has been kept at 4%. Also Read: NSC is better than Tax Saving Bank FD! Download the Official Notification from here. There is typo in date 31.04.2018 is actually 31.03.2018! 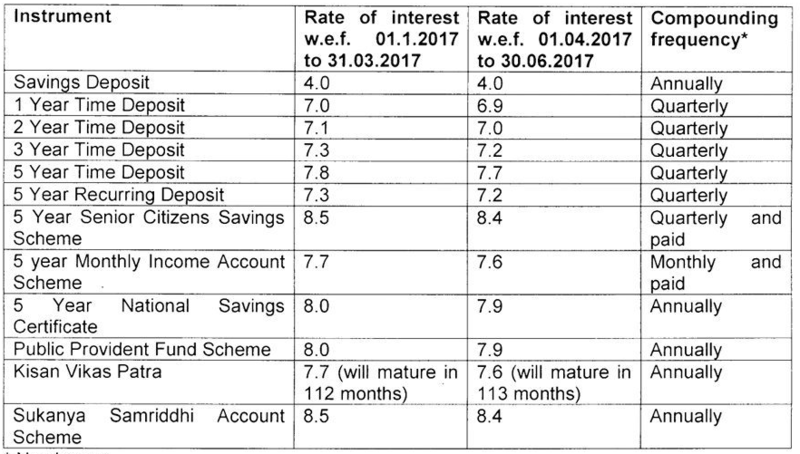 The interest rate on small saving schemes have been reduced by 0.1% from July 2017 for the quarter of July to December 2017. 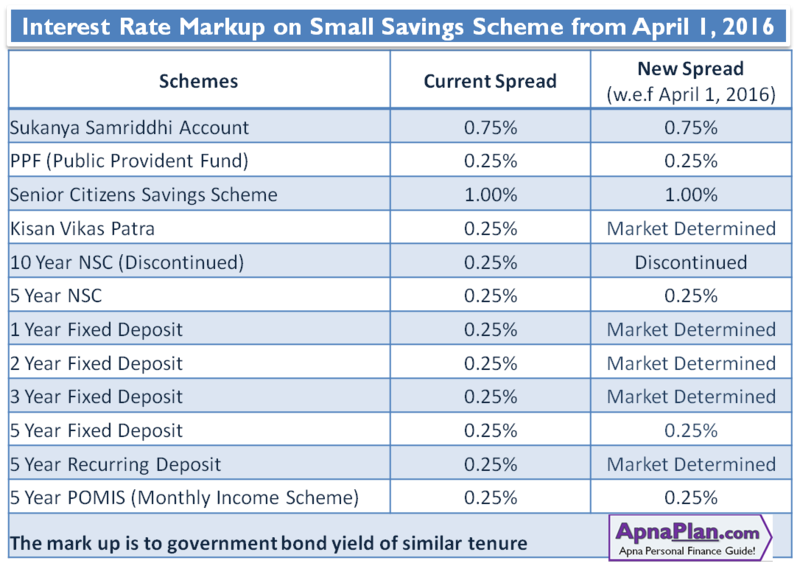 For long term and socially important small saving schemes like PPF, SCSS, Sukanya Samriddhi Scheme, NSC and 5 Year post office fixed deposit the rates are fixed as slight mark up to the government bond yields. 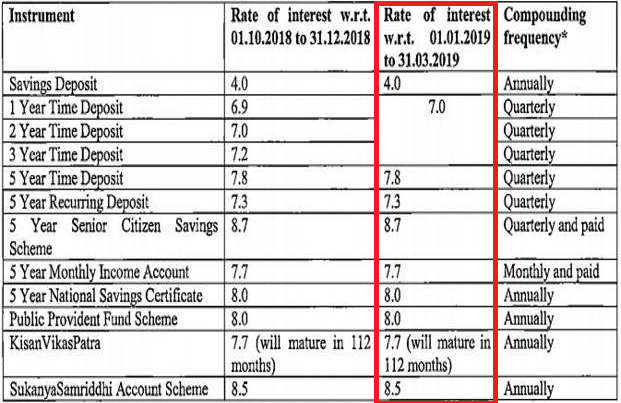 For other small saving schemes namely Post Office Fixed Deposits (1, 2 and 3 years tenure), Recurring Deposits and Kisan Vikas Patra the interest rates would be market determined, which means would be similar to that offered by banks on corresponding deposits. Unfortunately government is not following the above rules. There have been substantial reduction in benchmark yields but is not reflected in small saving schemes – which is good news for investors. The interest offered are locked-in for Post Office Fixed Deposits, Recurring Deposits, POMIS, KVP, NSC and Senior Citizen Savings Scheme and so the interest offered is as on the date of investment for the entire tenure. However for Sukanya Samriddhi Account and PPF the interest is offered as declared every quarter irrespective of the time of opening of account. You can bookmark this page as we would update this every quarter as and when the new interest rates are declared. All information in the artical are very useful. Thanks for sharing your ideas. SIR, Very useful. Thank you. You put great information about small saving schemes in India. You can learn more about NPS here. Very useful article indeed. The interest rate of Sukanya Samriddhi Account has been reduced a lot compared to it’s launch time. However, it still is the best savings scheme for a girl child in India. Thank you for sharing the new interest rates for this quarter.